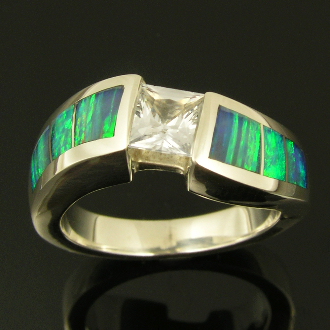 Unique handmade sterling silver white sapphire ring inlaid with Australian opal. Beautiful blue-green Australian opal with a striated pattern is inlaid into a heavy sterling silver ring mounting with a gentle curve design. The opal also has some orange and red fire at some angles. The princess cut white sapphire is 5mm square and weighs .80 carats. White sapphire is a great natural alternative to a diamond. White sapphires are very hard and durable stones that look very similar to diamonds at a much more reasonable cost. This ring measures 6.5mm wide at the top and is a size 6 3/4. This ring will be made to order in your ring size in 4 to 6 weeks. A blue topaz, garnet or other colored stone could also be substituted for the white sapphire and other inlay stones could be substituted for the opal inlay by special order. Contact me about price and availability for stone substitutions before ordering. For information about white sapphire as a diamond substitute please read our white sapphire blog post. Photos of more white sapphire jewelry on our Flickr page.